The new age of digitally vertically integrated companies has allowed us, as men looking to dress better, to gain access to really high quality garments, shoes, and so on at radical prices. We’ve been able to get quality far past what we are paying due to the fact that these companies have cut out the middle man. And on top of this, most all of these companies have amazing shipping and return policies, under which you can have something shipped to you within just 2-3 days for free, and return it for free as well with an included return shipping label. This makes the whole process super easy and convenient, and encourages customers to order a whole bunch of items, and merely return what they do not like — no big deal. However, there is still one major drawback to this all, and that is that you still have to put down the money. Sure, it’s not that, say, SuitSupply will allow you to order two or three (or more!) suits at a time, and you can merely keep what you like and send back what you don’t. But you still need to actually put down and pay the thousands of dollars that can cost, and then wait a few weeks for them to receive and process the refund! Now, sure, this is all just part of the game. And I’m not complaining here per se. Companies like SuitSupply still have amazing shipping and return policies, and steal customer service. But Amazon is trying to go one step further with their new Amazon Wardrobe. Assuming you are a Prime member, this allows you to order (at least) three items, have them shipped to you absolutely for free, without paying any money at all, whatsoever. You can try it on for a couple of days, and then send back what you don’t want. Whatever you keep, you will then be billed for. Whatever you don’t keep, you were never billed for in the first place, and so don’t have to worry about any returns. There are a couple of subscription clothing companies that do similar things (though some actually bill up front and then refund you), but Amazon provides an even better, easier to use service, without the need for subscriptions (well, other than your Prime membership, of course). You can use Prime Wardrobe whenever you’d like, and there is nothing extra you need to sign up for, or anything annoying like that. Quite honestly, it’s a pretty underrated feature of Amazon Prime, which is why we are writing about it here today. Of course, we had to give it a test run, so we threw three things into our Amazon Wardrobe cart, and placed an order. Our total was zero dollars and zero cents, as advertised. After the typical Amazon Prime 2 day wait, our items showed up. We went with a boat shoe, a Lacoste driving loafer, and a Michael Bastian polo (mini reviews down below). For one, it’s incredibly cool and super convenient. That certain feeling of guilt you have when you throw one more item in the cart “just to try it” is simply not there, as it is not added cost to you. Want to try one pair of shoes on in three different sizes/widths? Go right ahead! You won’t be billed for anything you do not keep, so you don’t have to worry about it. It’s a super freeing and liberating way to shop, and we hope it is indicative of the future of online shopping. That being said, a few downsides: (1) There is a very limited stock of items right now available on Amazon Wardrobe. They clearly have some brand partners they are working with, and there are definitely some nice items available now, but it is not even remotely close to the full inventory of Amazon Fashion. (2) Unlike the usual 30 day return policy for Amazon Prime purchases, you only have 7 days to try Wardrobe items on and take them for a spin before deciding if you will send them back or not. If Amazon does not hear back from you within the seven days, you will be billed (though you can always then, to our knowledge, go through the normal return and refund process still). Now, this is a bit of a blessing in disguise, as it sort of forces you to really make your decisions on your clothes, and get them sent back or dealt with, as opposed to letting them sit around your home for a month as you continue to push off actually deciding what you will keep, or packing up the box to ship back. So, the added urgency was actually something I quite liked. We also really liked the fact that the Wardrobe box is a little different front a typical Amazon Prime box, in that it had a pull-tab to rip open, and a strip of adhesive that you can use to repack the box for the return. Plus, there is a return label included right inside the box — no need to print anything at all. And the return label was the same size as the shipping label, so no need to Sharpie anything out. It’s really super simple to return. So much so that we would say this was the simplest and easiest returns process, overall, we have ever experienced. To top it all off, the Amazon website makes things super easy as well. Instructions inside your box tell you to visit your Orders page to tell Amazon what you will and will not be keeping. At the very top of your page you will find a prompt telling you how much time you have left in your current Wardrobe order, and asking you what you would like to keep and what you will be sending back. You just make your selections, and you’re done. Again, all in all, this is a super convenient and easy to use system. As far as the process goes, Amazon absolutely nailed it and hit it out of the park. Now I just hope more brands on Amazon Fashion sign up to be included in this program! I’d love to be able to use it all the time! 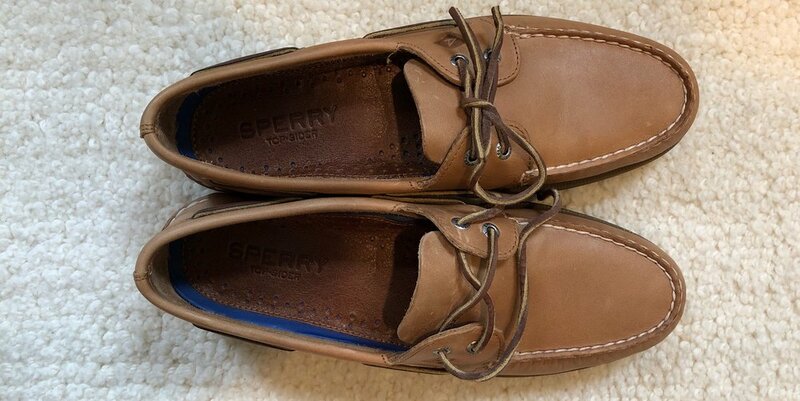 Sperry Boat Shoe: The classic boat shoe, and the one we would most recommend. Well-made, will last for many years, and, if you’re into boat shoes at all, you cannot go wrong with this one. Available in a ton of colors and, unknown to most, width measurements as well. For a slip on shoe like this, you really want to make sure it fits perfectly, and that added width selection allows you to do that. Lacoste Driving Loafer: As far as driving loafers go, at this price point, these are some of the sleekest. I have had multiple pairs over the years, and while they don’t seem to hold up for more than a year or two of semi-regular wear, they sure do look good while they last. If you’re into driving loafers, these are a good option worth considering. Michael Bastian Polo: Some of you might indeed be surprised to see Michael Bastian garments on Amazon, especially for lower than their usual super-high prices. Well, this is his line for a wider audience. Not quite as high quality or high fashion as his “real” stuff, but still well-made (think J Crew or Banana Republic level), with some high-fashion details, like, in this case, a button-down collar, and a longer placket. Fit is fairly trim throughout, though the sleeves are quite wide, so if you like a snug bicep fit, and aren’t quite jacked, you might be disappointed. However, given you can try all this stuff absolutely for free, why not give it a spin?! See how awesome something like Amazon Wardrobe is? !